Sunday baseball diversion: Is Felix Hernandez done? Felix Hernandez got pummeled yesterday, giving up 7 runs in just 2 2/3 innings before getting yanked. He is now 8-9 with a 5.58 ERA for the 2018 season. This is his fourteenth season in the Major Leagues; he was a rookie at the tender age of 19 in 2005. Is King Felix just having a bad year, or is it time for him to pack it in? Pitchers have bad years all the time, even elite ones like Hernandez; in 2006, his first full year in the majors, he went 12-14 with a 4.52 ERA. Maybe their mechanics are a little off, or they’re not getting along with their teammates and the coaching staff, or they simply never find their groove that year. It happens. To figure out what’s really going on with Hernandez, we need to look for larger trends to see where he is in his evolution as a pitcher. Fortunately, we don’t have to look far. Felix has been a healthy workhorse for almost a decade and a half, but that’s changed. Bringing pitchers straight to the major leagues is always risky, doubly so when they are 19 and haven’t had the experience of college baseball. Rookie Felix was very young and very inexperienced. The Mariners staff kept him under 200 innings pitched for the 2006 and 2007 seasons (just barely), but from 2008 through 2015 he was 200+ innings every year, peaking at 249 innings in 2010 when he was just 24. By comparison, 24 is the age that many pitchers first arrive in the majors, after being carefully handled through the minor leagues; Felix already had logged over 900 innings for the Mariners before his 24th birthday. That kind of workload, especially in the early 20’s, takes a severe toll on pitchers. Felix was shockingly durable in his 20’s; he didn’t make a single trip to the Disabled List between 2009 and 2015. In 2016, he was out for six weeks with a calf strain; last year he had three separate stints on the DL with shoulder issues that kept him on the shelf for almost half the season. So far this year, he has been on the DL once, for back soreness. He’s not getting the results he used to. His ERA has been trending up since 2014 when it was at a career-low of 2.14. Not coincidentally, Felix was 28 years old that year; conventional wisdom holds that’s the age that most baseball players peak (though there’s variance as to how long they remain at that peak). In 2015, his ERA jumped to 3.53; then 3.82 in 2016, and an ugly 4.36 last year. To-date in 2018, it’s 5.58. He’s also giving up more hits, more walks, and more home runs per inning. Felix’s velocity is down. Early in his career, his fastball was in the 95-99 mph range. But over the years, as is typical for most pitchers, he has steadily lost velocity. Last year it was more like 91-92, and this season it has rarely topped 90 (in yesterday’s blowout his fastball never made it to 90 at all). When fastball pitchers reach the point in their career when their go-to pitch is no longer getting the job done, they attempt to switch to a mix of other pitches to fool batters, and Felix has done just that; in fact, in his last few outings you could count on one hand the number of fastballs he’s thrown in the entire game. The good news for Felix is that he has a handy arsenal of other pitches. 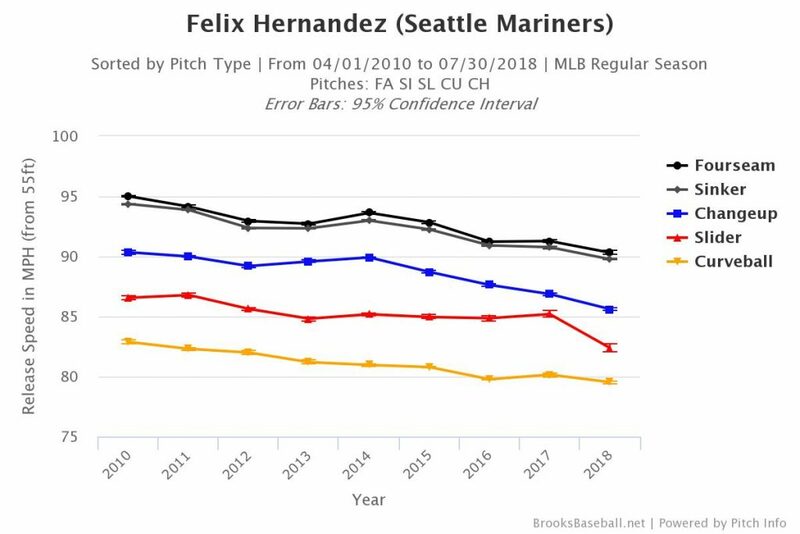 A good fastball pitcher has at least two other pitches that he mixes in to keep batters off-guard; Felix has four: a sinker, a curveball, a changeup, and a slider (he also has a cutter and a slow curve, but almost never uses them). That versatility was a key to his success for years. 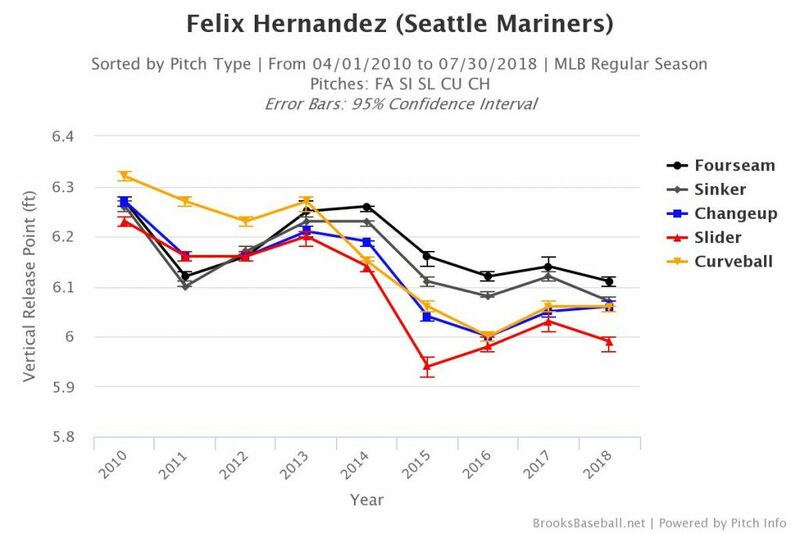 Unfortunately, Felix has lost velocity on all of his pitches; worse, most of them are converging on the same mid-to-upper-80’s range of speed. The difference between a 95-mph fastball and a 90-mph changeup is much larger than between an 89-mph fastball and an 85-mph changeup; in the latter case, they’re both slow fastballs. And the results are exactly what you would expect: batters are getting more hits off of his pitches. The number of hits per inning that Felix has given up has steadily risen since 2014, and it’s now back to where it was in the earliest days of his career. Even with five-plus pitches in his arsenal, he simply isn’t missing bats like he used to. Felix’s pitching mechanics have changed. Specifically, his release point, according to Baseball Prospectus. That alone isn’t unusual; pitchers will do that to continually try to improve over their career, to adjust for injuries, and to prevent batters from learning how to predict their pitches. But in Felix’s case, the vertical release point for his changeup is now different from that of his fastball. That makes it much easier for batters tell the difference between them early — and the whole point of a changeup is that it’s supposed to look like a fastball but be much slower. Now they look like different pitches, on top of far less speed differential. Sometimes these kinds of changes (injuries, velocity, mechanics) sneak in quietly, but in that case can also be corrected quickly in spring training or with a trip down to AAA. But in Felix’s case, they are multiple-year trends. The Mariners have all the top-of-the-line technology and expertise to analyze the hell out of his health and his pitching; it’s inconceivable that they don’t know this is going on. The fact that it is still going on means that this is the “new normal” for Felix. He’s lost his edge, and by the time batters get their second or third at-bat against him, they will know how to read his pitches and start lighting him up. Sadly, it looks like King Felix’s days as an ace starter are over. Still, he throws five different pitches, and his off-speed and breaking ones are pretty good. It might even be the case that if he moved to the bullpen and focused on 1-2 inning stints instead of 5-6 inning ones, he could reclaim a couple of points on his velocity and avoid giving batters too many looks at his pitches. It might even keep him healthier. He would be an exceptionally well-paid middle reliever next year under his current contract (the Mariners already have an elite closer in Edwin Diaz), but one way or another the team will be paying him $27 million so they might as well get as much value as they can for their money. The King’s Court won’t like seeing Felix move to the bullpen, but the current situation is untenable particularly given that the Mariners have a decent shot at making it to the postseason this year. The team currently has the longest playoff drought of any active team (13 years); if keeping Felix in the rotation costs the team a slot in the playoffs, there will be a lot more angry fans than can fit into the King’s Court. One last note: a trade is unlikely to help Felix. Safeco Field is one of the most pitcher-friendly stadiums in baseball, and playing half of his games here is actually boosting his performance. Also, there is no sign that any friction exists between him and management, the coaching staff, or his teammates. Seattle is as good as it gets for an aging former ace with declining skills. The only real questions are how long he keeps playing here, and what role he can hold on to.